After finishing my first two quilts, I started a complicated, time-consuming project, the Off Track pattern from Cluck Cluck Sew. Just the cutting took three days of work (a day’s work is a one or two day session). So it was a bit of a relief to take a break from piecing to try a simpler design and some quick techniques for a new baby, our friends’ daughter Esther, born in September. Her simcha bat (a Jewish naming ceremony) was in January, and I decided after Christmas to make something for her. The fabric leaped out at me and the design was meant to be an abstract letter E.
It’s a great size for a baby quilt, WOF (44″) by about 50. It’s almost perfectly 1.5 yards by WOF. I got a yard of the circle print and a half of the purple. 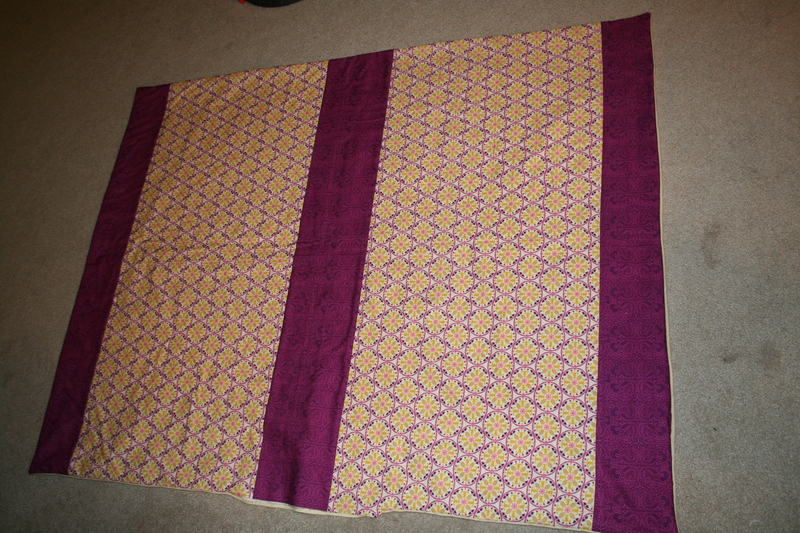 I decided to try the quick turn method of binding, but the first time I stacked and basted, I had one side inside out. But when I tried it again, I was so happy with the results. 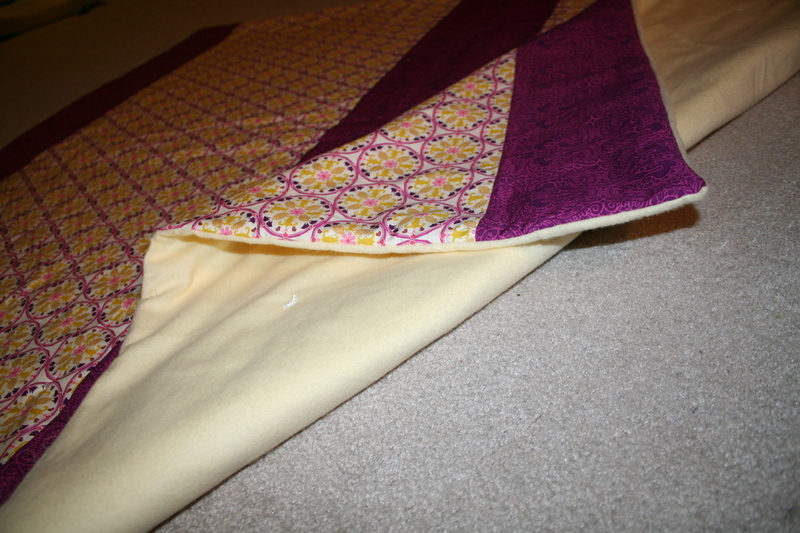 The backing fabric is really pale yellow flannel for softness, and I used batting for warmth. Quick turning is kind of like making a pillowcase, you sew the layers wrong sides together, leaving a small stretch for turning. Then you pull it inside out, which is actually right sides out, and hand sew the hole with invisible stitches. I tied the layers together with embroidery floss to prevent shifting, and voila, easy baby quilt. 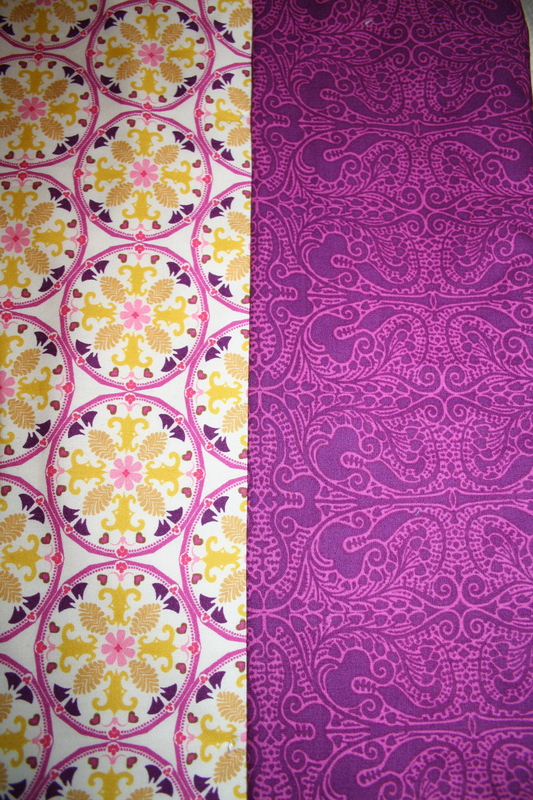 I’d like to gain enough confidence to machine quilt a quick turned blanket, but that will come with practice, I’m sure. Maybe when it’s not a gift. 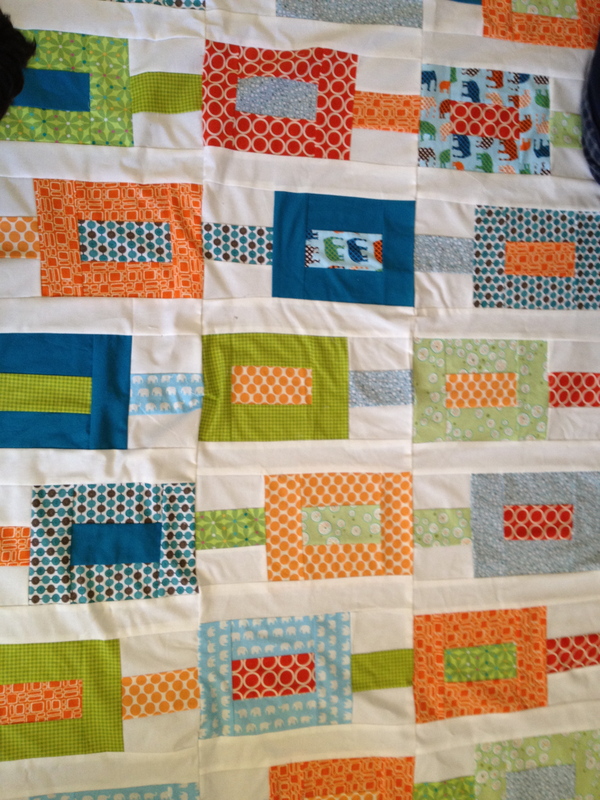 The naming ceremony was two weeks ago, so I have made some progress on the Off Track quilt.